Montmartre Bakery is an artisan bakery that sells preservative-free bread and baked goods made with natural ingredients, whole grains and in-season fresh fruits. A family-run business, Montmartre has been baking delicious products in Scarborough for over two generations. Over the years, the owners and bakers have adapted original European recipes and traditional baking techniques to produce healthy product choices without compromising on taste. Montmartre doesn't use trans fats in their bread. They never add chemical additives or chemical preservatives and offer vegan, fat free, gluten free and sugar free choices. 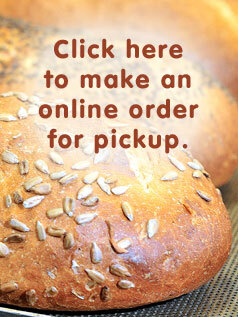 As artisan bakers, we bake our bread fresh every day. Every recipe has been developed using only a few, high quality, natural ingredients in order to produce a fresh, delicious and healthy loaf of bread. Our bakers are hands on, overseeing every part of the baking process. Quality at Montmartre means baked goods created with a few number of natural and healthy ingredients, always fresh, with our onsite bakers making sure every item is made with care. Honey Almond Cake - Available! Lemon Meringue Pie - Available! "I've been a weekly customer of them for 5 years... pretzels, strudels and other pastries are so good ... friendly staff."